Between stunning beaches, amazing food, vibrant nightlife, a seemingly endless array of cultural attractions and some of the best diving and snorkelling you’ll find anywhere, it’s no surprise that Thailand is atop many a traveller’s bucket list. After all, it’s just a flight away from many of the UK’s major airports, and flights to Thailand are often more affordable than other long-haul holiday options in Asia. (Naturally, you’ll know you’re getting the best price when you use Cheapflights.co.uk.) It’s also important to take on-the-ground costs into consideration. And, luckily for you, most everything else in Thailand – from food and accommodation to sightseeing and beer – is incredibly affordable. 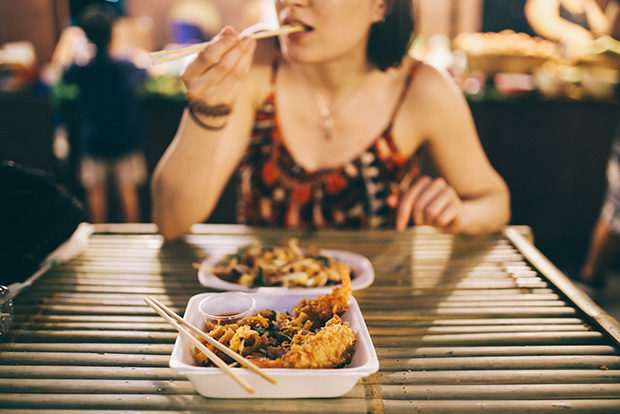 Read on for our tips and tricks to doing Thailand on a budget, and then head over to Cheapflights.co.uk to find your flights. The Thai Baht (THB) is the official currency of Thailand. At the time of writing, £1 is equal to around 42 THB and 100 THB converts to roughly around £2.37 (round up to £2.50 to make doing the conversions easier on the fly). Hostels, guesthouses, bungalows and hotels are plentiful in Thailand and all offer their own form of affordable accommodation, depending on your needs and budget. The cheapest options, for the most part, are going to be hostel dorms. Hostels are a great option if you’re looking to meet other travellers, but keep in mind that more upmarket, boutique hostels will likely cost more than a budget guesthouse, so look into whether the amenities are worth it before you book. Guesthouses and bungalows also offer up basic accommodations at affordable prices, with bungalows typically found closer to the beach. Pro tip: Look at a variety of rooms. Often in one guesthouse, the look, feel and furnishings of rooms can differ wildly, so it’s a good idea to look at a few. The easiest way to save money on food in Thailand is to eat like a local. If you stick to street food and night markets, you’ll pay as little as 50 TBH for a plate of noodles with vegetables. For something more filling, you’re looking at up to 100-120 TBH. Night markets can be found in almost every city and town and are basically a congregation of food stalls that operate from about 6 pm well into the night. Bangkok’s streets are lined with food vendors of all kinds, but there’s an especially high concentration of stalls in Chinatown, in Bangkok’s Old Town (Banglamphu) and along the backpacker stretch of Khao San Road. Pro tip: Thirsty? Buying beer at a 7-Eleven (you’ll find them all over Thailand) is your cheapest option and will set you back as little as 40 TBH. In Chiang Mai, night markets abound and you’ll also find food stalls at regular markets as well. Popular spots to find food stalls in Chiang Mai include the night market on Chang Puak Gate (or North Gate) and the Sunday Walking Market. Pro tip: Look for the busiest stalls as they’re obviously local favourites and will also have the highest turnover, meaning the food will always be freshly prepared. There’s so much to see and do all over Thailand that you could come back year after year for a decade and not experience all of it. Luckily, budget travellers can see a lot for free by sightseeing on foot. Bangkok offers lots of attractions that can be experienced for free or for fairly cheap. You can’t go to Bangkok (or Thailand in general) without visiting a temple or two, and the tremendous Wat Pho with its giant (46 metre) reclining Buddha is a must. The cost is around 200 THB and includes access to the grounds around the temple. Hanging out in sprawling Lumpini Park is free and the vast green space offers trails, a lake and free aerobics classes in the evenings. Other fun options include wandering the massive and colourful Chatuchak Weekend Market (also called JJ Market), climbing the 318 steps to the top of the Golden Mount for great views over the city and exploring Chinatown. Chiang Mai also offers a lot of free and low-cost things to see and do. Explore Chiang Mai’s Old City with its temples, markets, food stalls and shops. Spend time visiting the city’s numerous temples (most of which are free to enter), checking out the city’s vibrant markets and listening to free jazz courtesy of North Gate Jazz Co-op (there’s no cover to listen). 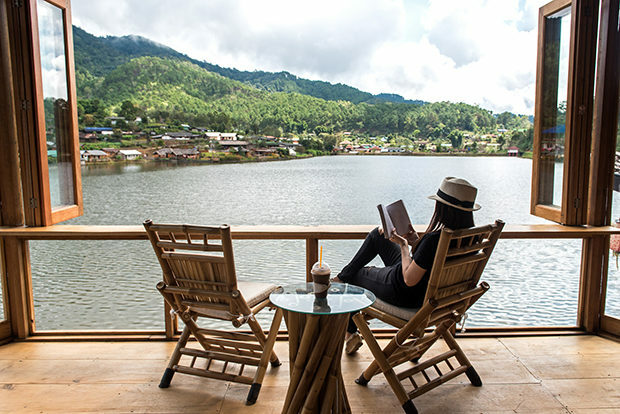 To spend more time outdoors, visit Huay Tung Tao Lake, with its backdrop of lush, green hills (50 THB) and explore the waterfalls and trails of Doi Suthep-Doi Pui National Park (200 THB, 100 THB for kids). In the south, the most pricey activity is generally diving, so skipping that can protect your wallet. However, as there’s so much to see under water, consider snorkelling instead. If you’re staying on the beach, rent equipment from your bungalow (most will have some available for rent) or hire a boat to take you further afield (a particularly good option if there are a few of you splitting the cost). Otherwise, lounging on the beach is a no-cost activity. There are many ways to get around in Thailand including bus, train, domestic airlines, taxis and tuk-tuks. Within a city or town, taxis are generally your best bet for saving money since they’re metered (tuk-tuks are not). 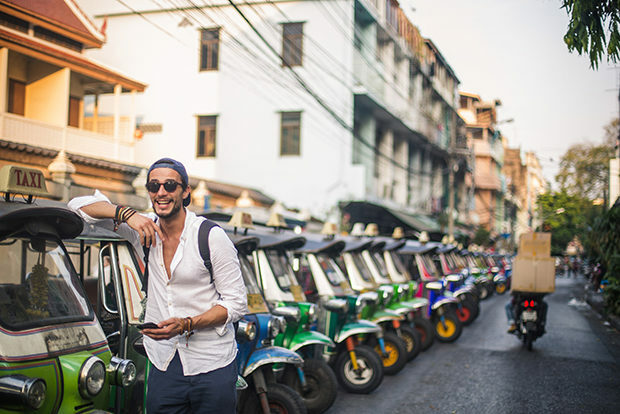 If you do take a tuk-tuk, agree upon a price before you set off to avoid overpaying once you arrive. In Bangkok, the Skytrain (BTS) and underground (MRT) rail systems also make for a fast, cheap and efficient way to get around. A one-day pass will run you around 120 THB. If you’re travelling between towns, buses are an affordable option and the bus network is extensive. It can often be cheaper to book an overnight bus if you’re going longer distances, but budget airlines like Air Asia and Nok Air are also an option for hopping around the country. Ready to go? Start planning your Thailand adventure at Cheapflights.co.uk.